Is word play friendly branding the key to successful technology? The Raspberry Pi (not pictured above) is currently blowing raspberries at its competitors at an impressive rate of four thousand per day. 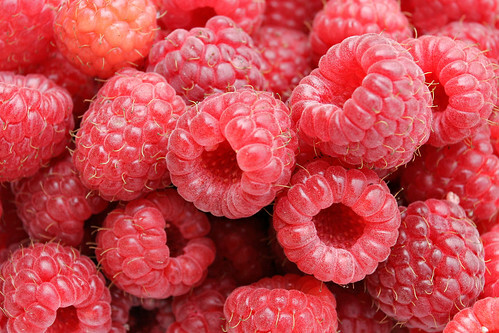 Creative Commons licensed picture of Rasberries by Fir0002/Flagstaffotos on wikipedia. The key to successful technology is not just the tricky combination of innovation, determination and investment but also word play friendly branding. Google Inc. has given rise to the verbs Googling and Oogling, a headquarters known as the Googleplex, employees variously known as Googlers, Nooglers, Zooglers and Xooglers, products and nouns such as Froogle, Loogle, Moogle, Poogle, Yoogle and many others. Meanwhile the Raspberry Pi (a new $25 computer) has inspired lots of juicy puns including Raspberry Jam (spreadable jamming session), Pi Face (interface), a Great British Raspberry Pi bake off, Raspbian (Debian but for Raspberries), EyesPi (spy cameras), The MagPi magazine, trans-oceanic autonomous FishPi, nay-sayers blowing Raspberries and space-cadets dreaming of Pi in the Sky. No doubt many more tasty pi(e)s with various fillings and side dishes are currently being cooked up. The possibilities are endless, how about some Raspberry Pi and Peas or Raspberry Pi and Mash (or chips) with your Pi-nt of Raspberry Juice? It can’t be long before Pythagoras gets involved with his authentic greek pi / π or perhaps there will be a big Pi fight? So is word play really the key to technological success? Successful technologies often encourage word play, but word play does not make technology successful. Correlation does not imply causation and the examples above are very anecdotal. Still, word play is fun and probably helps brands without doing them any harm . Raspberry Pi is a particularly ripe brand for punning, are there any other #TechnoWordPlay examples?